Juan Ponce de León (c. 1460 – July 1521) was a Spanish conquistador who became the first known European to discover Florida after establishing the first European settlement in Puerto Rico. He is also famous for his legendary search for the Fountain of Youth. Earlier, he accompanied Christopher Columbus on his second voyage to the New World. He served as the Governor of Puerto Rico from 1509-1511 until being replaced in that office by Columbus' son, Diego. Having reportedly heard from local inhabitants of a miraculous spring that restored youthful vigor on an island called Bimini, Ponce de León equipped three ships and set out on his voyage of discovery and conquest in 1513. On this journey, he sailed south along the Florida coast, charting the rivers he found. Ponce de León later organized a colonizing expedition to Florida. However, soon after the expedition landed on the southwest coast of Florida, the colonists were attacked by native Calusas and Ponce de León was hit by a poisoned arrow. After his wounding, Ponce de León and the colonists sailed to Havana, Cuba, where he soon died of his injury. Chief Agueybana greeting Ponce de León. Juan Ponce de León was born in Santervás de Campos (Valladolid), Spain. As a young man he joined the war to conquer Granada, the last Moorish state on the Iberian peninsula. Ponce de León accompanied Christopher Columbus on his second voyage to the New World. Although evidence is uncertain, it is believed that Ponce de León first landed near present-day Cockburn Town on Grand Turk in the West Indies but soon settled in Hispaniola. He helped conquer the indigenous Tainos of the eastern part of Hispaniola and was rewarded with the governorship of the newly created Province of Higuey. While there, he was attracted by stories of the wealth of Borinquen (now Puerto Rico) and received permission to go there. In 1508, Ponce de León founded the village of Caparra, the first settlement in Puerto Rico. He was greeted with open arms by the Taino chief Agüeybaná and quickly gained control of the island. As a result, Ponce de León was named Governor of Puerto Rico in 1509. He and the other conquistadors forced the Tainos to work in the mines and to construct fortifications. The Tainos died in great numbers after exposure to the European diseases that the sailors brought with them, to which they had no immunity. Ponce de León became wealthy while serving as Governor. He married a Spanish woman named Leonore and had two daughters and one son. In the meantime, however, Christopher Columbus' son, Diego, had taken his own claim to the governorship of Puerto Rico—denied to him in 1506 upon Columbus' death—to the highest court in Madrid and won his rights. As a result, Ponce de León was removed from office in 1511. Feeling that his good name had been damaged and not wishing to serve Diego, Ponce de León obtained official permission to explore the areas north of Cuba instead. 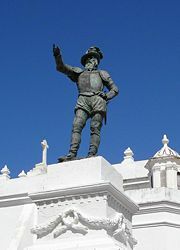 Statue of Juan Ponce de León at the Plaza San José in San Juan, Puerto Rico. Ponce de León equipped three ships at his own expense, and set out on his voyage of discovery and conquest in 1513. He had reportedly learned from local inhabitants of an island called Bimini which contained a miraculous spring that restored youthful vigor to those who drank from it. On March 27 of that year he sighted an island, but sailed on without landing. On April 2, he landed somewhere on the northeast coast of Florida, claiming the land for Spain. He named it La Florida, meaning flowered, both because of its lush vegetation and the fact that it was the Easter season—Pascua Florida in Spanish. Ponce de León then sailed south along the Florida coast, charting the rivers he found. He passed around the Florida Keys and up the west coast of of the peninsula to Cape Romano. He then sailed back south to Havana and then up to Florida again, stopping at the Bay of Chequesta (Biscayne Bay) before returning to Puerto Rico. Ponce de León may not have been the first European to reach Florida. He encountered at least one Native American in Florida in 1513 who could speak Spanish. 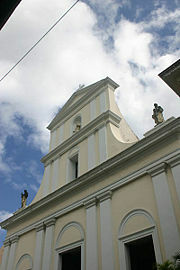 The cathedral in San Juan where Ponce de León tomb is located. In 1514 Ponce de León returned to Spain and received commissions to conquer the native Carib people of the Caribbean island of Guadalupe, and to colonize what he still believed to be the Island of Florida. His expedition to Guadalupe in 1515 was not successful, and he returned to Puerto Rico where he stayed until 1521. Ponce de León then organized a colonizing expedition to Florida on two ships. It consisted of some 200 men, including priests, farmers, and artisans, 50 horses and other domestic animals, and farming implements. The expedition landed on the southwest coast of Florida, somewhere in the vicinity of the Caloosahatchee River or Charlotte Harbor. The colonists were soon attacked by native Calusas and Ponce de León was injured by a poisoned arrow to the shoulder. After this attack, he and the other colonists sailed to Havana, Cuba, where he soon died of the wound. His tomb is in the cathedral in Old San Juan. Ponce de León is widely believed to have discovered Florida while searching for the Fountain of Youth. Though legends of vitality-restoring waters were known on both sides of the Atlantic long before Ponce de León, the story of his searching for it when he discovered Florida was not recorded until after his death. In his Historia General y Natural de las Indias of 1535, Gonzalo Fernández de Oviedo wrote that Ponce de León was looking for the waters of Bimini to cure his alleged sexual impotence. A similar account appears in Francisco López de Gómara's Historia General de las Indias of 1551. In 1575, Hernando de Escalante Fontaneda, a shipwreck survivor who had lived with the natives of Florida for 17 years, published a memoir in which he located the legendary healing waters in Florida, and says that Ponce de León was supposed to have looked for them there. Though Fontaneda doubted that Ponce de León had actually gone to Florida looking for the waters, the account was included in the Historia general de los hechos de los Castellanos of Antonio de Herrera y Tordesillas of 1615. Whether or not Ponce de Leon's was truly searching for the "Fountain of Youth" may never be known for certain. In any case, it is clear that the underlying motivation in his discovering Florida was that of a colonizer and explorer. Wealth and power were likely what drew him north, as much as any promise of restored youth and vitality. Ponce de León's main claim to fame is the discovery of Florida in 1513, and that he was the first European to establish a colony in what is now known as Puerto Rico, serving as its first governor. He also searched for the legendary Fountain of Youth, which has entered the world's annals of lore and legend. However, Ponce de León also left a legacy of death and destruction among the native population. The Taino and the Calusa peoples who were living in Florida at the time were overcome not only by the Spanish conquest, but also by the spread of measles, influenza, and smallpox, for which the natives had no immunity. Even though the Taino have died out, their inventions of hammocks and barbecues are used worldwide. Today, Ponce de León’s legacy is evident in Puerto Rico, where Spanish is still the official language and Roman Catholicism, brought to the island by the Spanish, is the main religion. ↑ Fernández de Oviedo, Gonzalo, Historia General y Natural de las Indias, book 16, chapter XI. ↑ López de Gómara, Francisco. Historia General de las Indias, second part. ↑ Wilkinson, Jerry. "Fontaneda's Memoir" Translation by Buckingham Smith in 1854. www.keyshistory.org. Retrieved January 8, 2008.
de Gómara, Francisco López. Historia General de las Indias of 1551.
de Oviedo, Gonzalo Fernández. Historia General y Natural de las Indias. 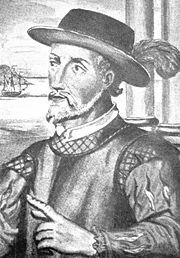 History of "Juan Ponce de León"
This page was last modified on 4 April 2008, at 00:13.